When you see him for the first time, you will be mesmerized by his kind big liquid dark eyes. Latif is a rare combination of exotic beauty combined with a gentle character that takes command as he trumpets his supremacy to all who will listen. His pedigree speaks for itself with a long line of legendary horses. 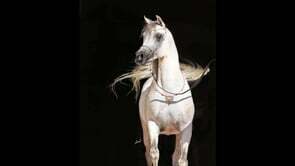 He has double lines to Makhsous through Marquis I and the gorgeous daughter of Makhnificent KA, Aidahh KA. Aidahh’s dam is the incredible Imperial Madheen daughter MB Masaleena. There are many others including Ruminaja Bahjat, Ansata Shah Zaman, Hoda, and TheEgyptian Prince, just to name a few. CONTACT SONRISA FARMS TODAY TO INQUIRE ABOUT YOUR NEXT BREEDING!